Insect farming has rapidly grown over the last decade, and now is a multimillion dollar industry. It wasn’t too long ago that insects were solely bred for pets and zoos… but this is changing as the “Insect Food Revolution” takes off. Pound for pound, insects are the most efficient way to produce animal protein for humans. This presents new markets and a good opportunity for people to earn income from your garage or shed. Best of all you can start very inexpensively and expand as your experience and markets grow. Insects however are far more than a potential source of income.…they can also save you money by converting waste food scraps into rich compost for your vegetable garden or insects to feed your chickens, fish or pigs. To give you an example how insect breeding markets have changed over time, we started breeding insects some 13 years ago for wildlife rescue/reptile keeping, then expanded to zoos, pet stores and reptile owners. In the last 5 years enquires into the human food market has increased dramatically (most of our enquires). We now use our insects for aquaponics to produce organic vegetables and fish. The markets are endless with insects now also being used for; food dishes; high protein products such as protein bars, flour etc; or as a protein supplement to animals such as chickens, pigs and fish. The reason for the steady rise in insect farms for human consumption is not due to it being a short term “food fad”, it comes from the sobering fact that we need increase food production by 60-100% by 2050 just to keep pace with our ever-growing human population. Insects can help solve this problem. For example, crickets need six times less feed than cattle, four times less than sheep and twice less than pigs to produce the equivalent amount of protein. Insects are an important solution to the worlds food crisis and will be around for the foreseeable future and are expected to grow rapidly. If you need more ideas on markets for insect breeding then look at the following link Markets for Breeding Insects. What Species Should I Breed? 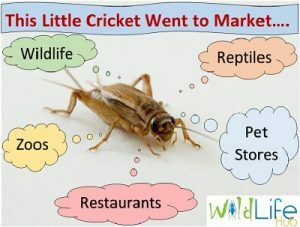 Crickets are the insect of choice for both the pet trade and human consumption. The main reason for this is that they are the most appealing insect for humans to eat, yet they are the most difficult species to breed (hence people need to buy them). Many Zoos, pet stores and wildlife rescue people often breed woodies (cockroaches) and mealworms but find it difficult to breed crickets consistently. Fortunately, we have developed a low maintenance cricket breeding system, so this is no longer a stumbling block and opens this market to the average person or business (more on this later). Woodies (cockroaches) are the easiest species to breed in large quantities and we set them up for aquaponic businesses who want a cost effective and sustainable food source to replace fishmeal pellet food. However the same principle can be used with other animals such as chickens, pigs etc. We are taking this one step further and trailing ways to replace fish meal and insect food with other sustainable food sources such as duckweed and moringa. This will save input costs and improve the price of the product (organic and sustainable). Mealworms are popular with wildlife rescue and moderately so for human consumption, however we have moved towards Soldier Fly Larvae as we can convert waste food scraps to feed or insect colony. In this way we save money as we don’t have to buy meal and get the extra benefit of rich compost for gardens. They also don’t need the active management that mealworms need. However, everyone will have a personal preference and there are a lot of pros and cons to consider for each species. If you need more ideas on choosing a species look at the following link Markets for Breeding Insects. In many regards breeding the insects is relatively easy, however stopping them getting eaten by vinegar flies/pests or diseases is more difficult. For example, vinegar flies nearly wiped out our operations and it took me 12 months to work out how to beat a 1mm fly (a humbling and frustrating experience). There are other things to consider, including: choosing the right species, finding niche markets and doing things efficiently. One of the best things to do to get you on the right track is get good information and learn from other people’s mistakes. You could spend a decade in a shed experimenting (like I did) and get only so far. A more efficient use of your time is use methods others have developed and them make them your own. We have gone through all these hardships and developed tried and proven insect breeding method that are efficient and minimise problems with pests and diseases. For more information on common mistakes breeding insects visit this page Breeding Insects Mistakes. To work out if you want to breed insects, one of the first things to do is estimate how many insects you could breed in your spare shed, garage or room. You might be surprised to learn you can fit 12 containers (70L or 18.5 gallon) in a 13.12 square foot or 1.2 m2 area. To help you work out how many insects you can produce and the correct method, visit this page. How many crickets can I produce. The next thing to do is work out which species you want to breed and consider your markets which we have discussed above. When I started I used every method I could get my hands on and found many of them to be time consuming, messy and inefficient. After 13 years of experimentation we developed streamlined methods to feed, clean and breed insects. For instance, conventional methods for breeding crickets means you need to spray eggs every day, separate crickets into different containers (so they don’t eat each other) and continually top up water and food containers. This time-consuming process was the main reason people stopped breeding crickets after a few months. Our answer to this problem was developing the Substrate Cricket Breeding System which is perfect for small scale commercial and requires only 3 minutes maintenance each week (per 70L container) and does not need the active management of conventional methods. We also cover conventional large-scale production in full detail. Woodies are equally low maintenance.